This is a book about civilian life in Britian during WWII. Norman Longmate compiled the stories of hundreds, if not thousands, of people into a logical, highly readable format. 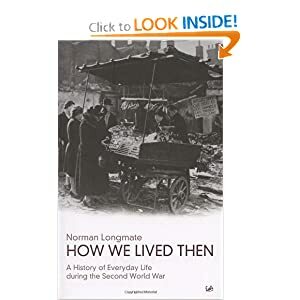 This book is wonderful in that it shows us how very brave, stoic and determined the British people were in living day-to-day during the war, especially during The Blitz. They quietly made so many sacrifices to save their nation during the war.The English population was full of heroes in terrifying times. I love day to day history books (how "normal" people lived). This is the ultimate book of these.